The children of Mary Jane Lee Park. Photos by Pamela Joye. 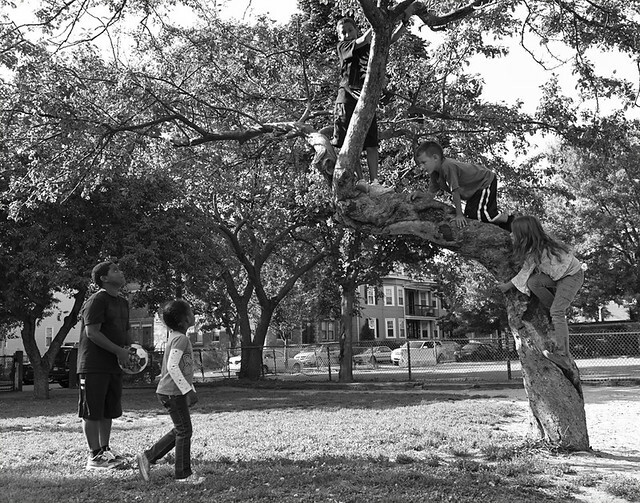 If Mary Jane Lee Park is the heart of The Point neighborhood, then children are at the heart of the park. I met Kara the very first time she took her five children to play in the park. On her third trip to the Mary Jane Lee Park, I asked her if she enjoys coming. “Yeah, it’s fun to see [the kids] have fun,” she answered. “I wouldn’t say it’s fun for me, really.” Her comment saddened me, as I viewed the park as a positive experience for everyone. Since this was the first of three interviews I planned to conduct with Kara, I hoped her opinion would change as she got to know the park. Her comment, however, holds a truth that took me some time to fully appreciate: for parents with young children, the park is not optional recreation, but a necessary place of play. According to Jan Gehl’s studies, public spaces generally fall into two categories: (1) necessary or (2) optional activities. For the latter, the quality of space has a direct effect on whether an activity – such as reading outside under the perfect tree – will take place. In the case of necessary occurrences, like the workday commute, space has little influence on whether the activity will occur – the unpleasant station and crowded subway car will still be used. Where does park space belong on the spectrum of necessary or optional spaces? Community betterment organizations often focus on affordable housing – but creating private shelter is not enough. Kara and her wife Jesse were grateful to obtain their apartment through a helpful state initiative, but their outdoor space is limited to a few square feet mainly occupied by the building trash bins. Inside space is also limited, and as Kara notes, “you can imagine in the apartment [the kids] pretty much sit still.” While for some a park might feel optional, for parents with children and little outdoor private space, the park fulfills an essential need. 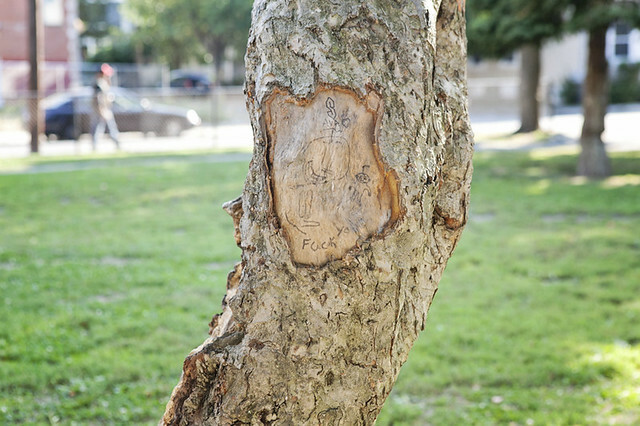 Carving at the climbing tree. The trash is not that bad compared to what I thought it would be like. I heard there would be condoms strewn around and hypodermic needles. I see a couple of older Spanish guys from The Point that clean it up. You don’t want the kids playing in glass – see that over there. I wouldn’t trust the sand too much. 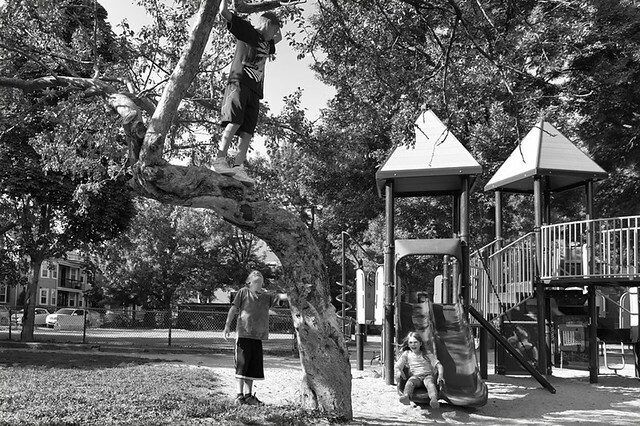 Despite all this, on most afternoons, Mary Jane Lee Park is filled with children at play – anywhere from ten to twenty children climbing up trees and sliding down slides. Numerous windows peering down from surrounding buildings seem like ideal viewports from which parents can watch their kids, while staying in with domestic duties. Whether or not the children playing are supervised is debated. Some parents claim to have seen three-year-olds alone at play. 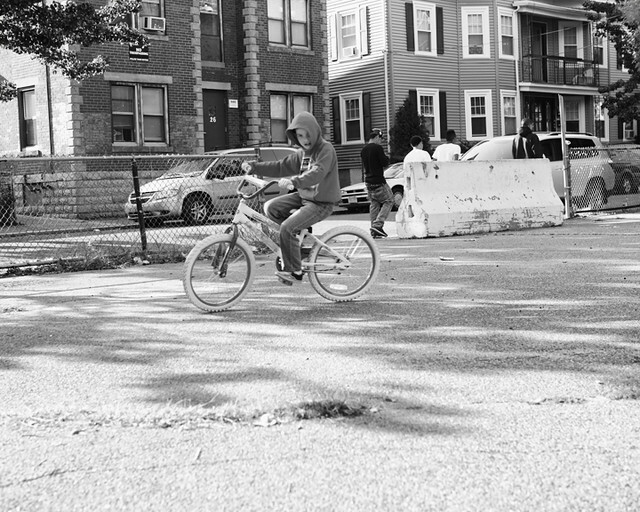 The image of the park itself is contested; its role in the neighborhood unclear – is it a liability or an amenity? Parents and their children at the swings. How and why do parents and their children use a park seen by some residents as unsavory, if not unsafe? To answer this question, I interviewed Doreen Thomas, a veteran park user with two boys, and as well as Kara and Jesse (mentioned above), who have just moved to the neighborhood with their five children. Their reflections on the “first impressions” the park can make on a visitor are recorded in my first article on Mary Jane Lee Park. Children on slides and swings. At the beginning of the summer, Kara, Jesse and their children were evicted from their single family house. Their ten-year-old son Liam has DiGeorge Syndrome, and since Kara stays home to take care of him, the family relies on a single income from Jesse, a tattoo artist. In January, they fell behind their rent of $1900. They went to court to try to figure out their options, but three weeks after the court hearing, they received a notice to vacate the premises in 48 hours. 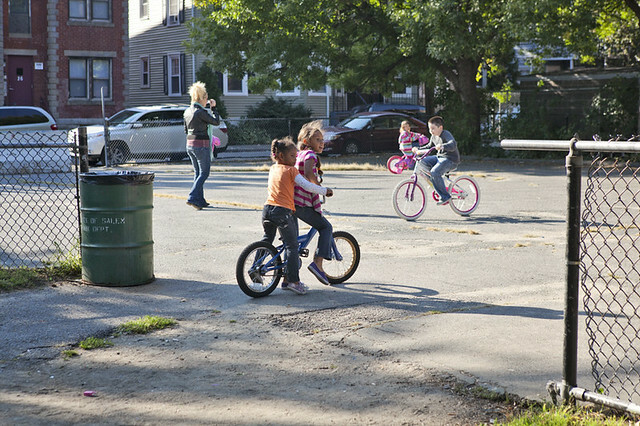 They went to a shelter in downtown Lynn, and lived in one room for a month and a half. It was dirty and unsafe. The situation held a particularly poignant twist for Kara, who grew up in the wealthy part of Lynn. Through North Shore Community Action Program (NSCAP), they were able to rent an apartment with the help of first and last month’s rent. (NSCAP is currently slated for Federal Cuts affecting such programs.) They chose to live in The Point because the neighborhood is in their children’s school district and they did not want to uproot any of them from school, especially Liam who has special needs due to DiGeorge’s Syndrome. The neighborhood holds such bad connotations that, for the first couple months, their eldest daughter preferred to walk the couple miles to high school, rather than be seen on the bus coming from The Point. Kara and a couple of her kids on bikes at the park. But now we know. The perception is just about the same. Walk five minutes down the street and you’re in historical beautiful downtown. At night, you walk down this way and, if you’re not familiar with the area, the people, the faces, you’re going to be pretty scared…Or robbed. So far their experiences have been mixed. They have befriended neighbors that look out for each other. They have also seen violence on the streets. Initially, Kara and Jesse let their kids play alone outside, but within a week, their eldest son Seamus, got punched and someone stole Liam’s Pokémon game. Liam riding in Mary Jane Lee Park. Kara doesn’t plan on staying long in The Point – just one school year. And as for Mary Jane Lee Park, “it’s good to have it here, at least I can come here and watch them,” says Kara, but “I would never let them go by themselves.” Many parents both have to work and don’t have time to watch their kids; many kids play alone in the park. Most adults say they watch out for children who are not their own. There aren’t always parents watching; sometimes there are small kids too. It is necessary for an adult to be there. The city sends over college students (to supervise and conduct lunch programs) and the park kids don’t have that much respect for them since there is such a small age difference. I worry that something could happen. There were needles and trash. I wondered why the park was like this. Our park in Everett was very clean. I started going and cleaning up the park. I would bring snacks for my kids, and as others started asking for snacks, I started bringing enough for others too. Within a year, Doreen met Ms. Cambell, a local community organizer, at a neighborhood meeting and began helping out at St. Joseph’s food pantry a couple blocks from the park. for 11 years, Ms. Cambell and I did this – since 2001. We did it because we love children. We had private donors, and St. Josephs was the Church donors, North Shore Medical, Crosby’s Market, Market Basket, a lot of important people in the community. 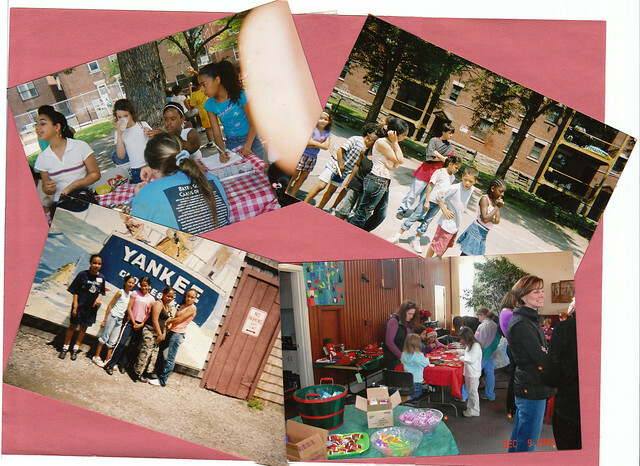 They gave 25 dollars so kids could go to our camp – we’d give them breakfast, the city would provide the lunch. We would take them on field trips, Heritage kids, whale-watching in Gloucester. 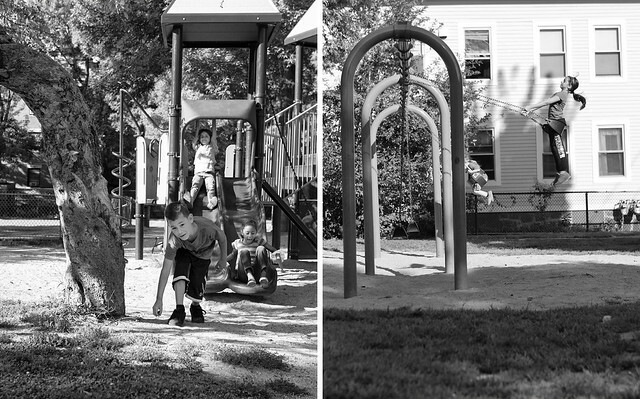 The programs for young children – simple, direct and useful – show the possibilities for the intersection between public, non-profit, and private funding and efforts to create productive events in a neighborhood and improve the physical structure. Doreen became the head of The Friends of Mary Jane Lee Park, and worked for two years with the mayor’s support to replace the old, splintering wood playground with a new one. Beyond the visual connection to many of the balconies and windows of the surrounding buildings, the bathroom in Doreen’s basement has served as the park bathroom. She also used it for the storage of new backpacks (for the back-to-school give-away), snacks, and other supplies. On a few rainy days, she even let the kids take refuge there, but once, after hosting an overwhelming forty children, she had to set the limit to ten kids. The park was the physical base of these activities, and the space itself attests to the power of porous boundaries to create a positive environment. Scrapbook photos of Friends of Mary Jane Lee Park activities. Image by Doreen Thomas. While Doreen still heads The Friends of Mary Jane Lee Park, she is no longer under the umbrella of a non-profit, and cannot continue the work in isolation. She hopes for a public or non-profit partner. This is a big issue. I need someone who will take me under their wing. I have ten volunteers who are willing to step up and work with me, but there is no funding. And there is a need. We provided an after school program, gave kids snacks and helped them with homework. And the same with the summer program, not everyone can afford camp. Doreen speaks of the park as a necessity for the many families whose children use it daily. She also notes that she sees fewer children play there since she has stopped her programs due to the lack of supervision and activities. Like Jesse and Kara, many parents don’t let their children play alone. The city sponsors an 8 – 9 week program with instructors who do activities with them. They finish at 4:00 p.m. and won’t take them on field trips. The kids need the attention but they don’t get it. People say the kids in The Point are lost. It’s not true. They have dreams, hopes, but they don’t have anyone cultivating. This one young lady, she was the first to go to college from her family. It makes me feel good and continue what I did. The Friends of Mary Jane Lee Park, the North Shore Community Development Coalition (NSCDC), and the Point Neighborhood Association (PNA), and the City of Salem all appreciate the potential of the park, but none are united towards a common vision for its future success. While the park is the main spatial focus of Doreen’s work, it remains a peripheral concern for the other groups; its effects are not easily measurable, and the park life is complex. There are the park users – the children and their parents – that everyone “approves of”. Local teenagers, sometimes loud and rambunctious, don’t do anything illegal but are sometimes seen as an inappropriate presence for the children. And then there are the supposed drug-dealers, who “everyone” thinks don’t belong in the park. To this latter group, no one knows what to do beyond the fatalistic notion of “getting rid of the park,” as suggested by one resident. As the City of Salem has obtained a grant to study the area and create a neighborhood visioning plan, what role should the park play? How can it move from a liability to an amenity? The answers to these questions depend on whether the main actors view the park as a necessity or an optional amenity for the neighborhood. Up trees and down slides. This past summer was the first that Doreen no longer had the support of a non-profit, and physical therapy for a foot injury was further reason why she could not supervise the children in the park as she had in the past. If she had been at the park, she may have met Kara, Jesse and their five children, and watched out for them as she has for others. Towards the end of our first interview, Kara said, “the park is the only solace in this neighborhood. I think this is the only place that you can go that looks somewhat decent.” Doreen Thomas can proudly name the children, now first generation college students, who grew up in the park. 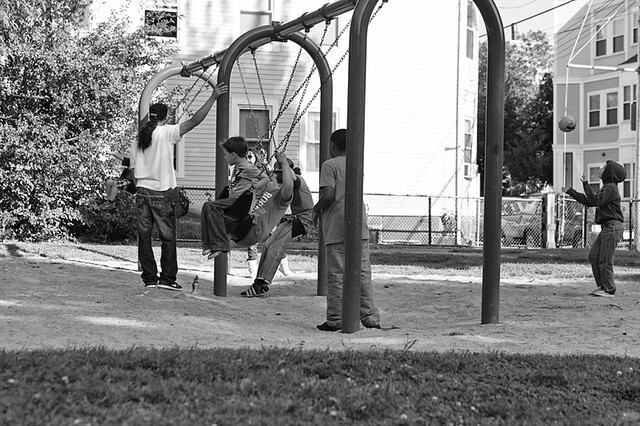 To find more photos of the children at Mary Jane Lee Park, visit Pamela Joye. Post by Claudia Paraschiv. Photos by Pamela Joye. Scrapbook image by Doreen Thomas.